With current events we find the age-old issue of race relations in the USA once again front and center. It is important to me that we engage in a national dialogue about race because I am a Caucasian parent of an adopted African-American son in his early twenties, who I often remind to keep his hood down and his pants pulled up. He is in this current culture a target. I say this also as someone who has met with fellow pastors and lay leaders at McCreary’s Pub in Franklin, Tenn., every Tuesday morning for the past 20 years. 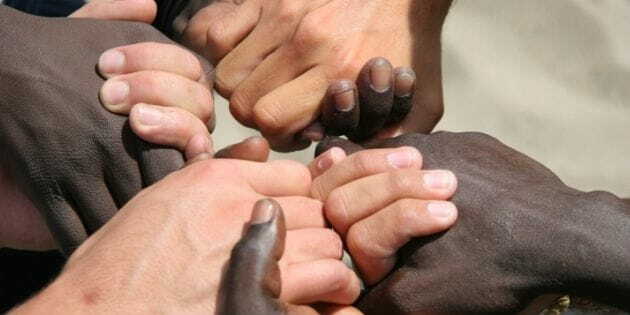 This meeting, known as the Empty Hands Fellowship, enables us to develop dialogues that span the boundaries of race, economics and denominations. Historically, the Christian Church in the United States has found itself on both sides of this division, with some who worked to bring equality and others who claimed the name of Christ and yet perpetuated division. While we have made progress in decreasing this division, we need to remind one another that racial bias is still present and requires us to continue to work toward reconciliation. Through Christ, reconciliation was made for everyone -- “persons from every tribe and language and people and nation” (Rev. 5:9). The foundation of racial equality is clearly laid out in scripture, namely that every person is made in the image of God (Genesis 1:27, 5:1). The significant value that each individual holds is behind Jesus’ command to “love your neighbor as yourself” (Luke 10:27). Jesus expands the definition of “neighbor” to include all people as he tells the parable of the Good Samaritan (Luke 10:25-37). However, it isn’t enough to say we value people or that we love our neighbor. As part of our faith, we are also to seek the good of our neighbor through our good deeds (James 2:14-19). There are other important steps that we can take. The Church must continue to take a leadership role toward racial reconciliation by embracing it within our local communities. Eradicating racism requires us, as the Church, to take responsibility for how we move towards reconciliation. When we began to meet as pastors of different races and backgrounds, for dialogue and prayer, we could sense our differences melting away. As Christian leaders, we can join other pastors and ministry leaders, through the efforts of organizations like Shepherding the Next Generation, to help prepare children for life’s challenges. As a member, I am well aware of the studies that show that investing in at-risk children with early childhood education, voluntary home visiting and family support for troubled youth enable children to grow up healthy, succeed in education and contribute to their communities in meaningful ways. As individual neighbors, we can begin the difficult but necessary discussions about race and reconciliation, increasing our understanding of unconscious bias and promoting unity. For those in the majority culture, it is somewhat easy to dismiss racial bias today, perhaps because it isn’t as blatant as it once was. The pursuit of racial reconciliation is difficult at best, but we have a hope that is greater. A hope that reconciliation and the pursuit of the good of our neighbors will win out over hatred and the pursuit of evil. As Christians, our pursuit of diversity and unity isn’t for the sake of reconciliation alone, but for the good of our neighbors and for the glory of God. Scott Roley served as a pastor in the Presbyterian Church in America for more than 20 years before founding The Franklin Table, a nonprofit ministry in Franklin, Tennessee. Roley also serves on the Advisory Council of Shepherding the Next Generation.